Wear a beige long sleeve t-shirt and blue ripped skinny jeans for a Sunday lunch with friends. Rocking a pair of Prada pointed ankle boots is a simple way to add extra flair to your getup. If you're a fan of comfort dressing when it comes to fashion, you'll love this totally stylish combo of a white crew-neck sweater and a grey fair isle mini skirt. Rocking a pair of charcoal suede ankle boots is a simple way to add some flair to your outfit. If you're a fan of relaxed dressing when it comes to your personal style, you'll love this chic combo of a grey knit open cardigan and a white floral maxi dress. 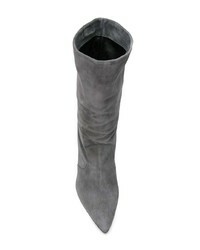 Sporting a pair of Prada pointed ankle boots from farfetch.com is a simple way to add extra flair to your getup. Dress in a light blue denim jacket and white ripped skinny jeans, if you want to dress for comfort without looking like you don't care. Elevate this ensemble with Prada pointed ankle boots. If you're obsessed with practicality dressing when it comes to fashion, you'll love this extra adorable combo of a mint crew-neck sweater and a beige skater skirt. Dress up this ensemble with charcoal suede ankle boots. If you're searching for a casual yet chic getup, rock a white and black knit cardigan with navy skinny jeans. Both items are totally comfy and will look fabulous paired together. Amp up the cool of your ensemble by finishing off with Prada pointed ankle boots from farfetch.com. If you're on the lookout for a casual yet chic ensemble, rock a black coat with blue skinny jeans. Both pieces are totally comfy and will look fabulous paired together. When it comes to shoes, this ensemble is complemented wonderfully with charcoal suede ankle boots. If you're in search of a casual yet totally stylish outfit, opt for a navy vertical striped coat and blue ripped jeans. Both pieces are totally comfy and will look fabulous paired together. 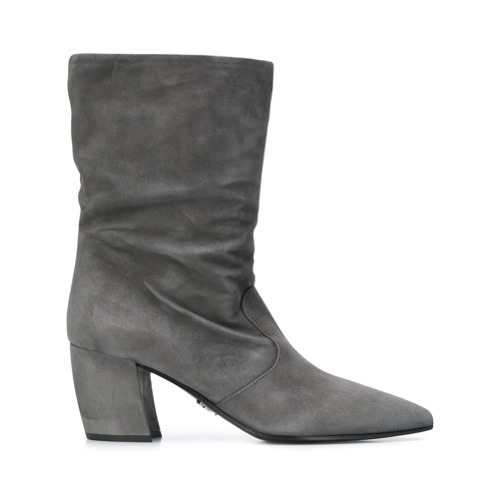 Wearing a pair of charcoal suede ankle boots is a simple way to add extra flair to your getup. If you don't like being too serious with your ensembles, dress in a light blue coat and a grey hoodie. You could perhaps get a little creative when it comes to footwear and lift up your outfit with charcoal suede ankle boots.